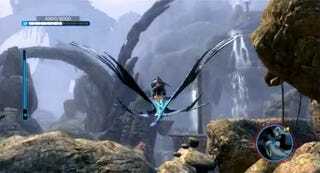 Shoot arrows, ride giant birds, and embrace your inner Predator, all in this Navi gameplay montage for James Cameron's Avatar: The Game. The main thing I walked away from this video with was a desperate yearning for a new Panzer Dragoon game. I'm not talking Panzer Dragon Saga II or anything - just me riding a dragon around a fantastic fantasy world, doing some stuff. There's not a Panzer Dragoon fan out there that could watch the flying bits of this vid and not feel the same way.